For the past couple of months, us Mood Sewing Networkers have been plotting to have a month where the entire group worked with a similar fabric. Lace was decided for March, and since I had already been lurking the lace selection and dreaming up options, I was 100% game. I was also inspired by Liz’s Macaron Lace Dress because GIRL(boy? ), have you seen that gorgeousness?! so jealous. I thought it would be fun to have the dress ready for Valentine’s Day – I’m not really much of a Valentine’s person (this is like, one of maybe four Valentine’s EVER that I haven’t been single, aha), but it’s not too late to start yeah? Not to mention, if I had a fancy dress all ready to go we’d HAVE to end up doing something. Preferably something that involved gelato. 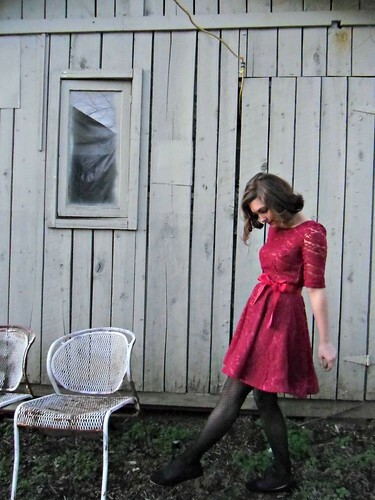 I knew I wanted a substantial lace in a bright color (no whites or pastels for me, please), and while my original dream dress involved visions of navy, I knew this red lace was “the one” the second I laid eyes on it. It’s perfect for this type of dress – the pattern is large and bold, but held together with delicate netting which keeps the fabric from being too heavy. Since it’s a cotton lace, it will wear nicely in the summer as well as during the cooler months we’re in right now. The lacework is erratic enough where I didn’t have to worry too much about matching up the design at every seam line (just thinking about that is making me break out in a sweat, argh!). Once thing I did notice with this particular lace is that the pattern runs parallel to the selvedge — so I had to adjust my pattern layout accordingly. 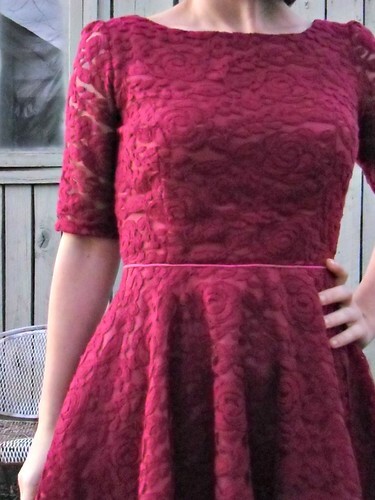 This wasn’t difficult to do, and my lace was wide enough where I was able to get my pieces in there (including the full circle skirt) without too much fuss, but I thought I would point that out if you are thinking about working with directional lace. I’m so used to the pattern running perpendicular to the selvedge, I almost didn’t check before I started cutting. Editor’s note: Click here for a selection of lace fabrics available at MoodFabrics.com. 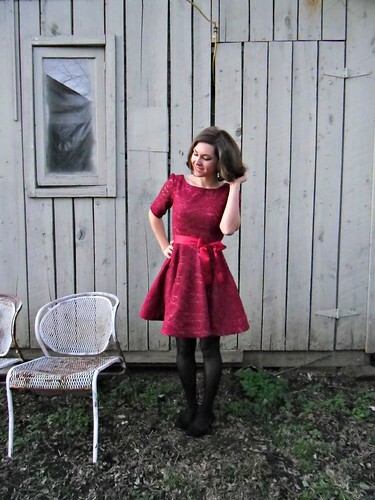 For this dress, I improvised and merged a few different patterns together to create my Frankenpattern Dream Dress: the bodice is McCall’s 5972, the sleeves are a vintage Butterick pattern, and the skirt is my self-drafted circle skirt. I’m actually surprised at how well everything fit together, like these pieces were meant to be. 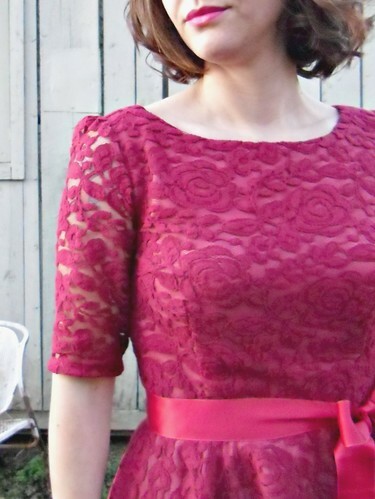 I love love love the bodice of this pattern; it’s definitely my new TNT. 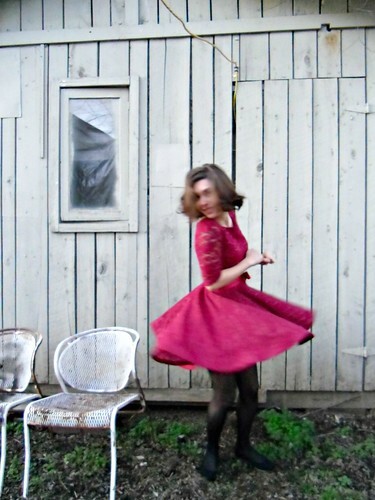 The dress is underlined with Bemberg rayon in watermelon pink – everything except the sleeves. 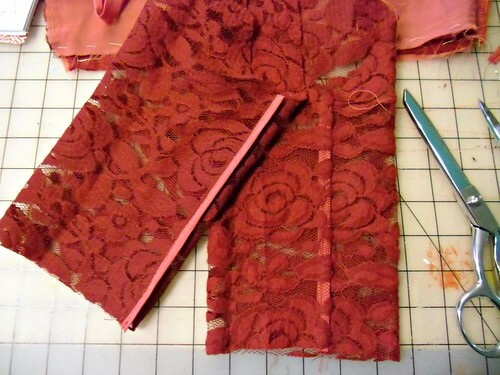 I decided to underline because I wanted to give the lace structure in addition to an underlying color – a hanging lining doesn’t do too much in terms of structure, plus the seams would show through the sheer netting. Choosing the right color underlining took some time – it was a toss up between white, Lauren-flesh, red, and pink. I felt like the first three were just tooooo predictable (although I still have some red lace leftover, so maybe I’ll try a different underlining with it! ), not to mention I loved the dimension I got with the pink underlining. To underline, I basted the pieces together by hand, using silk basting thread, around all edges and also along the dart lines. Then I sewed the dress up as normal, serging the seams as I went and pressing them flat. Like I said, I left the sleeves un-lined because I love the effect – look, you can see a tiny peek of tattoo! The sleeves posed a special challenge since they were unlined and I wasn’t sure how well that netting part would hold a seam. I had a small piece of pink cotton batiste in my stash that perfectly matched the underlining, so I cut long bias strips and bound the sleeve seams for extra stability. 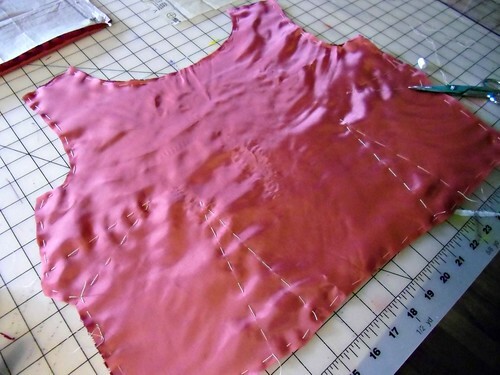 The resulting seam is very strong, and I love the little peek of pink that shows when I move my arm 🙂 I also used the pink cotton to face the sleeve hems and neckline, bind the armscye and waist seams, and add a strip of piping to the waistline. I hemmed the skirt with 2″ white horsehair braid, since I wanted it to flare. Actually, hemming was the worst part – and not because it involved nearly 5 yards of hand-sewing. 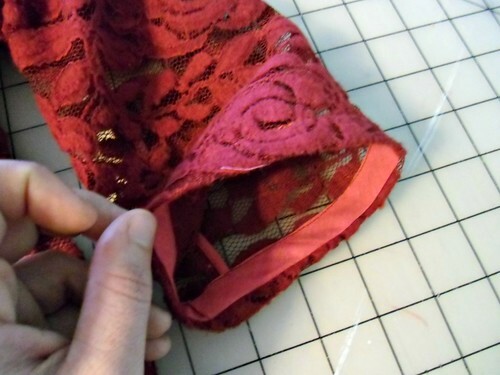 I could not decide how I wanted to treat the hem, since the lace is sheer and the braid would show through. The dress is underlined, including the skirt, but I was afraid that pulling the underlining all the way down to the bottom of the skirt would end up with some funky grain problems. In the end, I laid the skirt out VERY CAREFULLY on the floor and matched up the hems on the lining and lace, pinned everything together, and then stitched the braid on. There are a few areas where the fabric doesn’t hang *quite* right, but thankfully the giant circle skirt-ness of the whole thing kind of hides that. All in all, I think it’s a pretty snazzy Valentine’s Day dress. 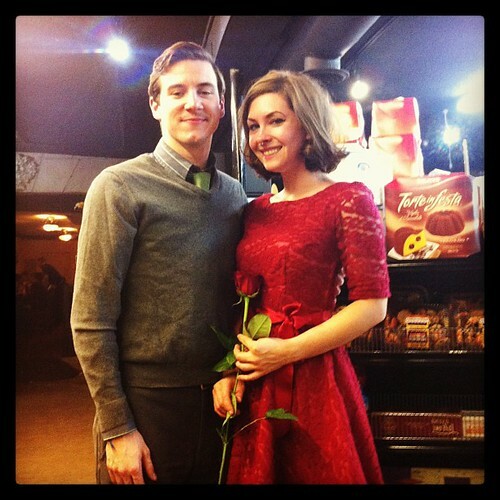 Lookit how fancy me and my man look! And just for the record – my evening did involve gelato, so yay!